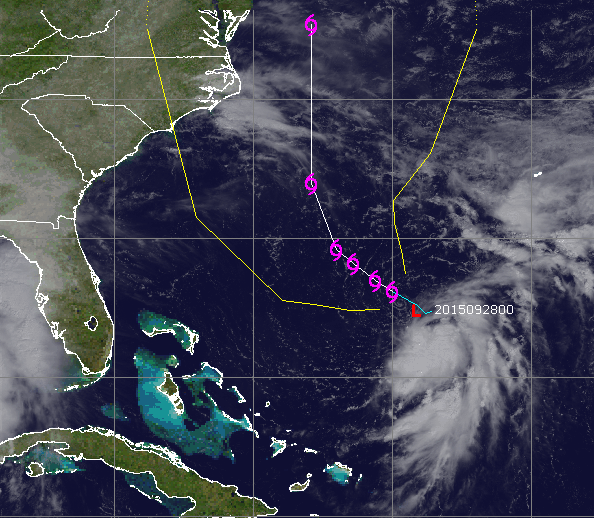 A newly-formed tropical depression off the southeast coast could move closer to New Jersey by the end of the week, bringing heavy rain, winds and rough surf, forecasters said. Tropical Depression 11 formed late Sunday and currently several hundred miles southwest of Bermuda. It is packing 25 m.p.h. winds and a great deal of tropical moisture. The storm is expected to become a named tropical storm, but will likely degenerate to a coastal low by the time it reaches the New Jersey area by Friday. The current forecast calls for the storm to remain offshore. In a briefing package released Monday afternoon, the NWS office predicts a “wet and stormy” weather pattern for the week. Later this week, the briefing said, winds will become northeast and intensify. Wind gusts of 20 to 30 m.p.h. are possible over inland locations. Wind gusts of 40+ m.p.h. are possible in coastal areas. There are two potential time frames for heavy rainfall. The first one is late Tuesday into Wednesday, unrelated to the tropical depression. Another round of heavy rainfall is possible late this week.